The Didi Sport 15 design started a few years ago and has been moving along very slowly, at the pace of the prototype that is being built by a very meticulous builder. 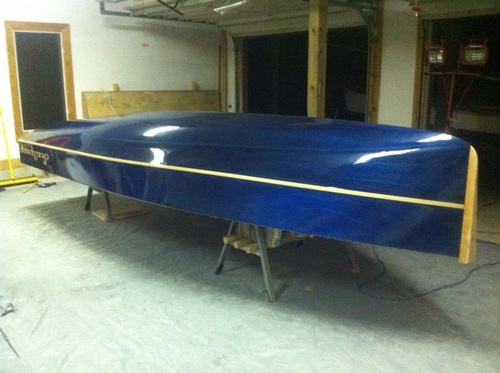 He is making a beautiful job of his new boat, hence the slow rate of building. This design started as a 16ft bigger sister to the Paper Jet. It was to be of similar concept but a twin trapeze skiff for two adults. When he told me that he also planned to use it as a picnic boat for four adults with cooler boxes, I told him that the Paper Jet concept really had no chance to serve all of his requirements. The concept immediately changed to what you see in the Didi Sport 15, as a ballasted sportboat. 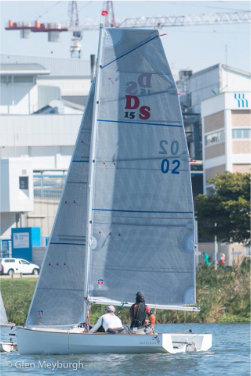 The Didi Sport 15 hull is a little sister to the Didi Mini Mk3 and a direct development from it. It has the waterline beam and stability to serve the picnic purpose that the builder wants, able to carry load in a relatively docile manner if reefed down to suit the breeze of the time. In this mode she is really a sportboat with a modern and powerful rig that can be reduced to be more docile if needed. With her full rig of squaretop mainsail, self-tacking jib and asymetrical spinnaker on a retractable bowsprit and launched from a chute, she will be a spirited racer for club Olympic triangle and point-to-point racing. Or just blast back-and-forth across the bay or lake until you wear yourself out from fun and excitement. She has a covered foredeck above a sealed rapid-draining wet deck, which creates a safe and dry storage area and shelter for small crew. These characteristics make her a good option for raid-type racing events that require carrying one's own stores, camping equipment etc over long distances between camping stops. Hanging a tarp or the mainsail over the boom turns her into a camp cruiser, with a cockpit long and wide enough for a couple of airbeds for a comfortable night anchored or nudged up onto the beach in a sheltered private cove. But this boat is schitzophrenic, it has a very different alternative personality for those who want to have some high-performance fun. 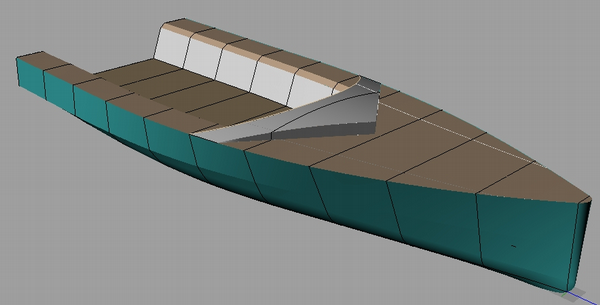 Remove the ballast bulb from the daggerboard and she morphs to what I originally intended with this design. She becomes a high performance skiff with one or two trapezes for adults. Construction is over permanent bulkheads and a ladder-frame backbone, with stringers. Most of the hull is 6mm sheet plywood, the exception being the radius area that is done with two layers of 3mm. 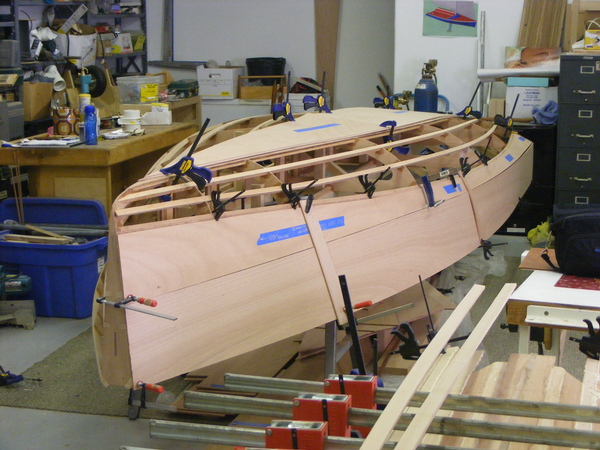 The topside chine uses a stitch-&-glue joint and increases the power from the stern when power-reaching. The deck and cockpit are all 6mm sheet plywood using stitch-&-glue detailing. DS15 being built from a CNC kit. 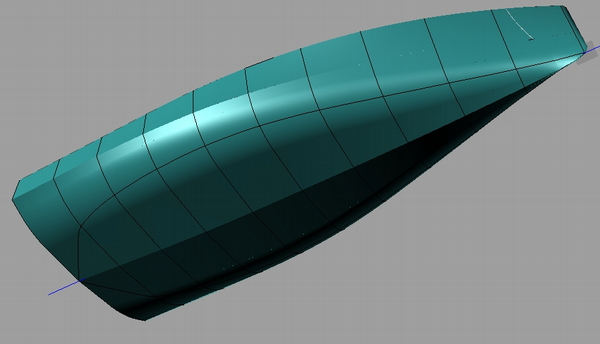 The images below have the sections and design waterline shapes included, to show the hull shape more clearly. DS15 3D Hull views. Radius chine underbody, topside hard chine aft fairing out forward. Detailing is based on the series of radius chine plywood designs that started with my DIDI 38 "Black Cat", and was followed by a string of designs through to the Didi Mini Mk3 and Didi 950. The standard plans package includes all detailing and full-size paper patterns of all bulkheads and the backbone. We also offer optional full size Mylar patterns for all plywood components to help with drawing the skin panels and speed up construction. For pre-cut hull, deck and bulkhead kits in USA go to our USA kits page. Kits are also available from suppliers in other countries; click here for supplier contact info. Please clarify with suppliers what is included in their prices. We can supply the CNC files to any supplier on the list that does not already offer a kit.